FRESNO CA (KMJ) – Crime may be increasing in the state of California but crime trends in Fresno show just the opposite. 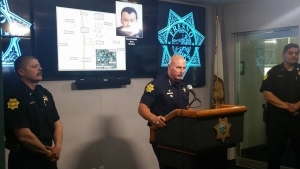 Fresno Police Chief Jerry Dryer says their strategy to stop domestic violence suspects quickly, and target gang members and career criminals is working. Crime continues to drop in numbers that Fresno’s police chief is happy to share. “Property crimes which are made up of burglary, larceny and auto theft are down by a staggering 19 percent,” says Chief Dyer. Last year 7 people died as a result of domestic violence, this year no one has, says the chief. Violent crime is down YTD by 1.5 percent. Shootings have dropped, 244 people were shot last year, 171 this year. Auto thefts are the lowest in 30 years, down 29.4 percent. Eight cars were stolen every day last year, it’s down to five, this year, and Chief Dyer says people are listening to their warnings and taking tempting belongings out of their vehicles so that thieves don’t. Captain Phil Cooley says the Central District is keeping an eye out for one man who was released due to jail overcrowding. 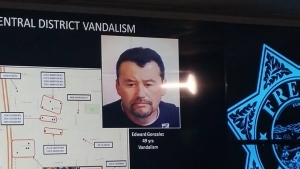 On May 11th, 2018, Edward Gonzalez (photo below) was seen on surveillance footage slashing tires, and he was arrested on May 14th, until police had to left him go. 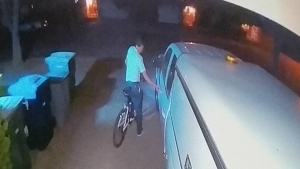 Captain Cooley says Gonzalez has been vandalizing tires and is suspected of some 30 cases of vandalism, where he punctured tires. 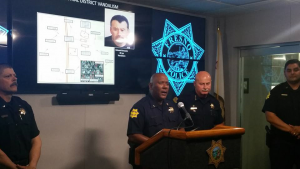 Gonzalez lives in the area of Ashlan and Fresno, and “If you see him in any neighborhoods, please contact us so we can contact him,” adds Captain Cooley, who says to call Crime Stoppers at 498-STOP and they will take him to jail.